At Synergy Chiropractic & Holistic Therapy, we believe that each individual requires solutions that are unique to them. To offer a comprehensive approach to health care, we utilize many different methods. We’ll be happy to advise you on which are most suitable for you and your goals. Dr. Ormsby and Dr. Wendy each have their form of chiropractic care. 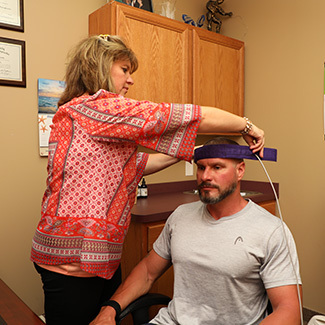 Dr. Wendy utilizes a holistic approach to care that involves Neuro-Emotional Technique and Total Body Modification. She also offers Indigo Biofeedback, which uses NASA technology to analyze stress. With hands-on methods, Dr. Ormsby’s patients benefit from Diversified, Thompson Technique and Gonstead. He also offers Activator® Methods for those who prefer an instrument adjustment. Imagine being able to self-heal using signals from your body? Indigo Biofeedback uses state-of-the-art technology to reduce stress so you can feel better and be better. Using spinal decompression, we are able to apply negative pressure to each disk, as a way to alleviate the pressure and pain related to compressed disks. Spinal Decompression employs traction to slowly and gently stretch the spine to increase the intervertebral disc spaces. This computer-controlled machine is programmed by our highly trained chiropractors. One of the biggest benefits of this therapy is that patients can avoid invasive and risky back surgery as well as pain medications, which can have serious side effects. The treatment typically takes a week of daily sessions, followed by five weeks of 3 sessions per week. In several clinical trials, 86% of the test subjects reported that their pain was immediately resolved after treatment. NET is an amazing way of clearing emotions that have found a home in your heart but are reeking havoc in your life. Our experiences in life create cellular memories. These memories get stored in our body and can come show themselves in many different ways. Phobia’s, bedwetting, infertility or any complaint can be traced back to old emotional memories. Even better, if you cannot recall why you may be feeling a certain way or acting a certain way, we can help resolve it without you having to recall the event. Visit www.netmindbody.com to learn more about this life changing technique. Synergy Chiropractic & Holistic Therapy carries the full line of Standard Process whole food nutrition. For more information go to https://www.standardprocess.com/. This is a device that uses current to pull toxins such as heavy metals, viruses, bacteria, yeast, fungus, medications and much more out of the body. Orthotics are a great way to help with issues related to walking and alignment. Some of these include but are not limited to knee, foot and lower back pain. The need for orthotics is often related to an issue with the natural functioning of the foot. Orthotics will often help to realign the bones within the foot and ankle and therefore take pressure off other parts of the body such as the back, neck, shoulders and hips. Orthotics are really for anyone with an issue or discomfort relating to walking or imbalances in the body that are known to cause related pain. The great benefit of orthotics is that they can be worn daily and be utilized during most activities to take further stress off the body. If you need to de-stress, relaxation massage is an excellent therapy. Our massage therapist offers 60- and 90-minute sessions. Kari Joy is a Licensed Massage Therapist. She understands that every person is unique and has certain preferences or unique challenges. She loves being able to customize a massage to the person’s needs. Kari Joy enjoys helping people find relief from migraines, shoulder tension, low back pain, and sciatica. She also does TMJ work and plantar fasciitis. Kari Joy listens to the needs of the client, whether it is Swedish, deep tissue, sports (therapeutic), pressure point massage or simply a relaxing deep stretch. Clients feel refreshed, energized, relaxed and ready for what the day may hold! To find out more about our services and how they may be able to benefit you, contact our Brunswick office today!